What equipment are consisted in a complete organic fertilizer production line? Most friends think that organic fertilizer production line contains only organic fertilizer granulator, which is a misunderstanding. Organic fertilizer granulating machine is a core link in the whole production line, but it is not the only constituent devices, because away from other equipment, organic fertilizer granulator can’t play out of his effectiveness, and can even be said that it simply will not work. What equipment are consisted in a complete organic fertilizer production line? 1. Equipment in fermentation stage. The main feature of the fermentation stage in organic fertilizer production line is to preliminary reducing moisture in organic fertilizer raw materials. As everyone knows that, main raw materials of organic fertilizer are chicken manure, pig manure, cow dung, sheep manure and so on, among them the humidity of chicken manure and pig manure is too high, especially chicken manure, so the manure with high humidity can’t be processed directly, so the fermentation stage is necessary. Generally speaking, through seven weeks of fermentation, the humidity of fresh chicken manure can be reduced sharply. 2. Crushing equipment in crushing stage. Animal feces after finishing the fermentation will be caked quickly, and block material is not easy to be directly dried, so we suggest that crushing is also necessary before starting the next link in organic fertilizer production line. 3. Drying machine in drying stage. Some people may want to ask, how do still have to dry it after fermentation process. In actual fact, fermentation can only control the humidity in a certain range, but the moisture must be less than 10% if we want real organic fertilizer pellets, so the drying process is also essential. 4. Pelletizing machine in pelletizing stage. Organic fertilizer pelletizing is the core piece of the organic fertilizer production line. In General, we recommend using a combination of granulator and ball machine, to achieve the features of granulation, because traditional disk grain making machine is not suitable for it. 5. Cooling and packaging equipment. Cooling and packaging link can be ignored for users with small productivity, only organic fertilizer production line with large production needs the automatic packing machine. 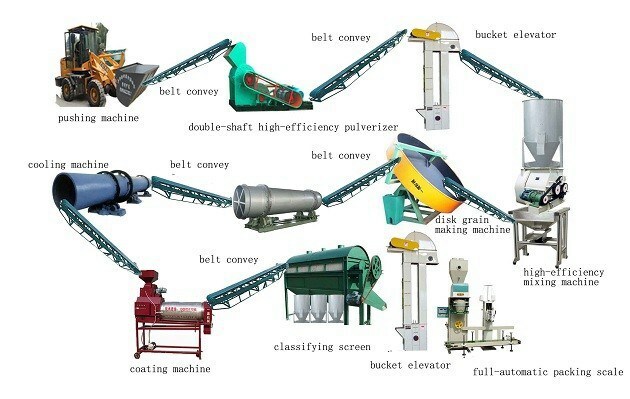 If users who want to make organic fertilizers more luster lubrication, you can select screening machines, throwing machines and coating machines for processing, thus allowing the production of granular fertilizer more beautiful.